Smart car with a not smart driver. Those cars are the biggest FAIL I’ve ever seen. They’re trashed in reviews for terrible quality. Impropper stowage of alchohol while operating a golf cart. lengthwise makes more sense to keep the center of gravity lower. and using more than one strap. and paying the $20 to get it delivered. how did they get it up there in the first place? @terwilligher: Well, lengthwise wouldn’t work. 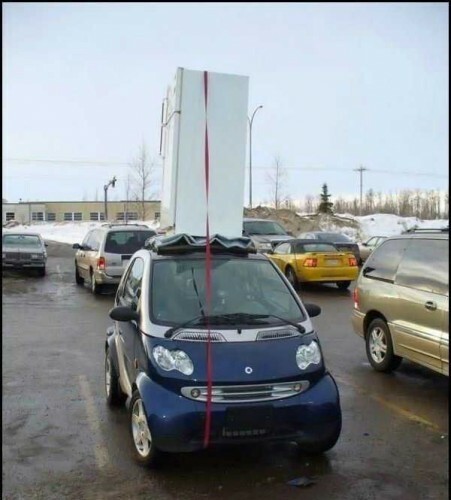 Laying a refrigerator down is bad for it. I’d rather drive the fridge.